Sterling Ultra Precision’s Optoform 80 is the world’s most technically advanced ophthalmic lathe for production of intraocular lenses (IOLs) and contact lenses. All the leading manufacturers of molded contact lenses are using the Optoform 80 or Nanoform series lathes to produce mold tools used in the production of polypropylene lens molds. The Optoform 80 with its smooth and stiff hydraulic oil bearing system is a performance level above the Optoform 40. Its unique architecture enables the Optoform 80 to produce no-polish surfaces critical in the manufacture of lens mold inserts and diffactive multifocal contact lenses. The Optoform 80’s flexible machine control software facilitates the manufacturing of a wide variety of contact lens and IOL designs including toric and non-symmetric when adapted with a fast tool servo attachment. 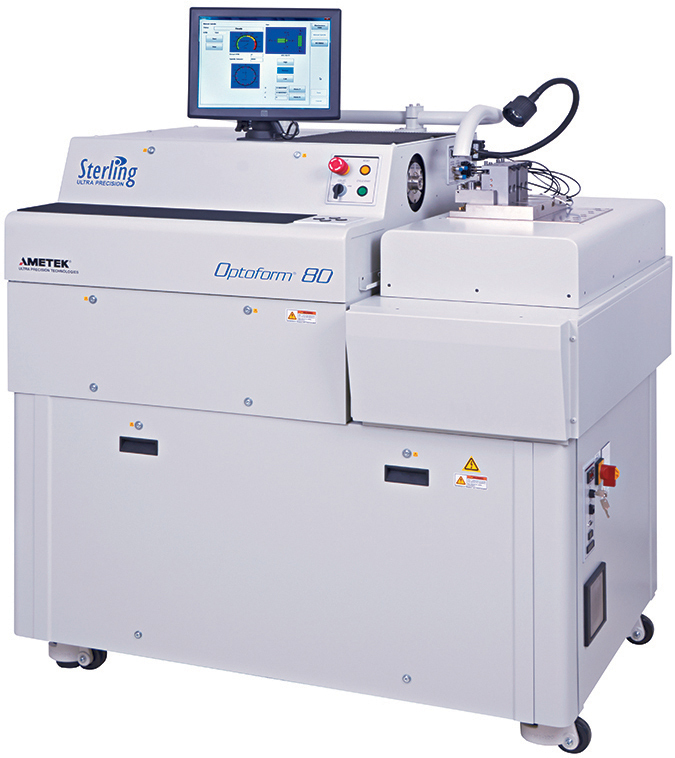 Sterling Ultra Precision’s FTS-1000 is a fast tool servo attachment for our Optoform and Nanoform series ultra-precision lathes. The FTS-1000’s 200 m/s2 peak acceleration enables production of high surface quality contact lens and intraocular lens toric designs at very high productivity rates. In addition to producing toric lens designs, the FTS-1000 is also ideal for manufacturing other non-rotationally symmetric contact lens features such as prism ballasts and slab-offs. The CNC Controlled Spray Misting Attachmentis an option which can be added to Optoform 40, 50 and 80 machine systems. (A different version is available for the Nanoform 200 and Nanoform 250.) The device delivers a controllable and adjustable mist of lubricating mist to the cutting area under computer control, so that only the nozzle assigned to the diamond tool which is actually cutting the part emits the spraymist. The benefits include significantly improved surface finishes as well as prolonged diamond life. Essential for cutting optical surfaces in non-ferrous metals (mold or insert production) and ‘no-polish’ GP lenses. This high-speed turning and milling option uses a normal high-speed ultra-precision machining process to cut parts, which are lathed with appropriate diamond tools. The applications of this device include alpha-numeric engraving of mold inserts, with the ability to strictly control depth, as well as direct milling of intra-ocular lens haptics. It then also automatically engages a low-speed capstan drive to control the part, which is being cut, initiating the milling phase of the operation. A high-speed air-driven turbine tool then cuts the part to a desired shape (e.g. cutting the haptics of an intraocular lens) or mills a desired pattern on the surface of the part. The normal high speed function or the low-speed capstan drive engages or disengages automatically and the diamond tool or the turbine tool moves into place automatically. This allows for the rapid sequencing of each part of the two-fold process, as milling alternates with normal high-speed ultra-precision machining of parts. The single fixturing of each part avoids inaccuracies. Click here to download Milling Attachment specifications.